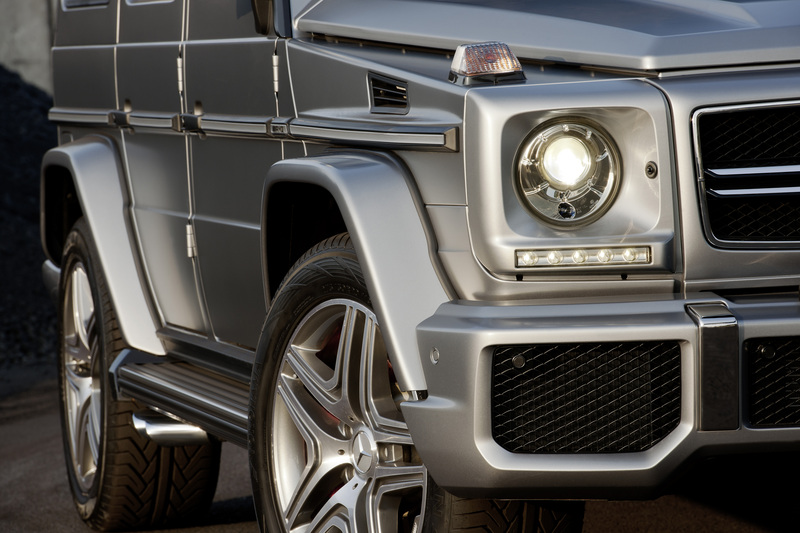 2013 Mercedes-Benz G-class. Photo courtesy Mercedes-Benz North America. One week after Mercedes-Benz unveiled their newly resigned GL-class at the 2012 New York International Auto Show the German manufacturer is back at it, this time with the mother of all luxury SUVs the G-class. Upon seeing the photos of the new G-class those familiar with Mercedes’ original all-terrain vehicle might be struck with the lack of changes to the exterior styling, and you would be correct in saying nearly nothing has changed to this road-going box on wheels. While most vehicles get significant upgrades and improvements when undergoing serious redesigns it’s obvious the G-class is not one of those vehicles, especially considering the fact that it has remained largely unchanged since its introduction in 1979. LED running lights and side mirrors give the 2013 G-class a slightly updated appearance, but it’s so minor many with untrained eyes would probably not even notice the difference. The high-performance G63 AMG receives the added bonus of 20-inch wheels complete with painted red brake calipers and an AMG-specific radiator grille, but that’s it in terms of exterior variation. While the oh-so-familiar exterior might leave some unimpressed, one only need to glance into the passenger cabin to see the real changes that make the 2013 G-class markedly different from its predecessor, most of which have taken place in the immediate vicinity of the driver. The instrument cluster and center console have been totally revamped and redesigned when compared to the previous generation G-class. The instrument cluster is made up of two round gauges, behind which lies a TFT (thin-film transistor) LCD display screen that acts as a controller for the COMAND infotainment system. At the top-center of the center console is a large screen that offers occupants luxurious amenities like DVD changer, navigation system with special off-road functions, voice-operated controls and wireless Bluetooth connection. 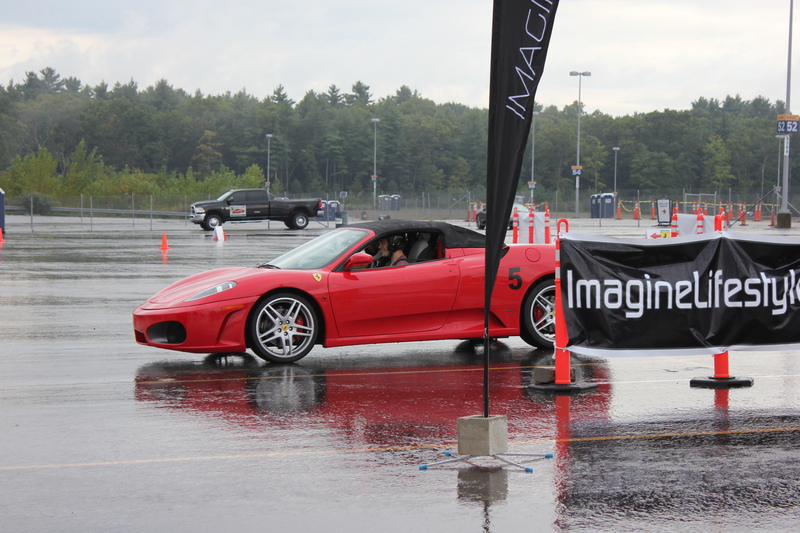 Rounding out the technological features are DISTRONIC PLUS, blind spot assist and PARKTRONIC with a reversing camera. 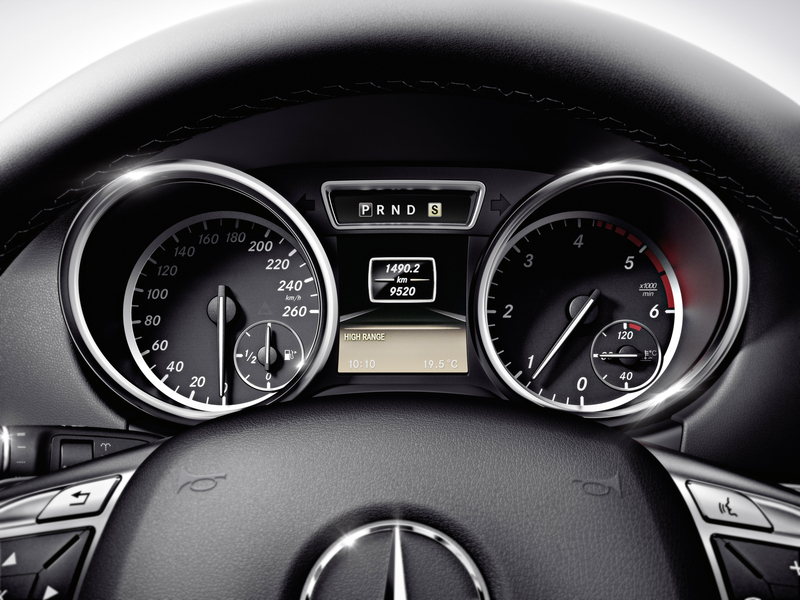 New instrument cluster in the 2013 Mercedes-Benz G-class. Photo courtesy Mercedes-Benz North America. Although the aforementioned instrument cluster and center console have varied from the 2012 model, two distinct design features have remained intact. 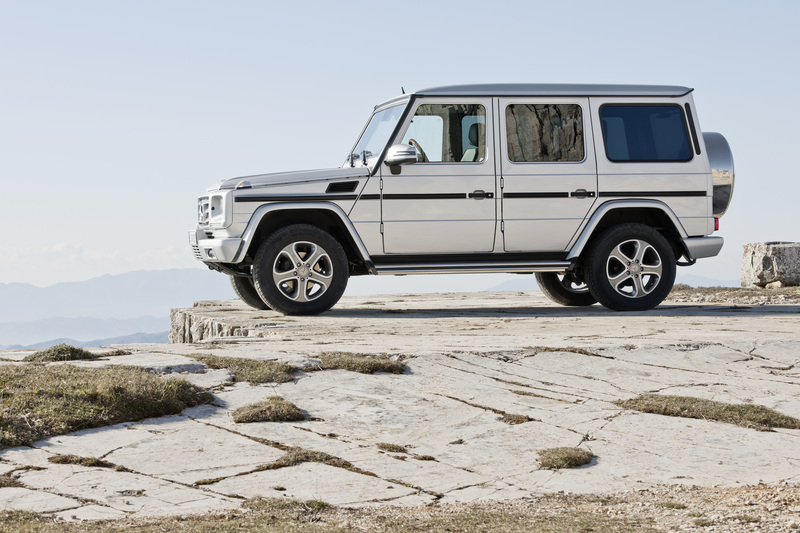 These include the characteristic G-class grab handle located on the passenger side directly above the glove compartment and the three buttons operating the three corresponding locking differentials that the driver can engage when navigating through difficult terrain. 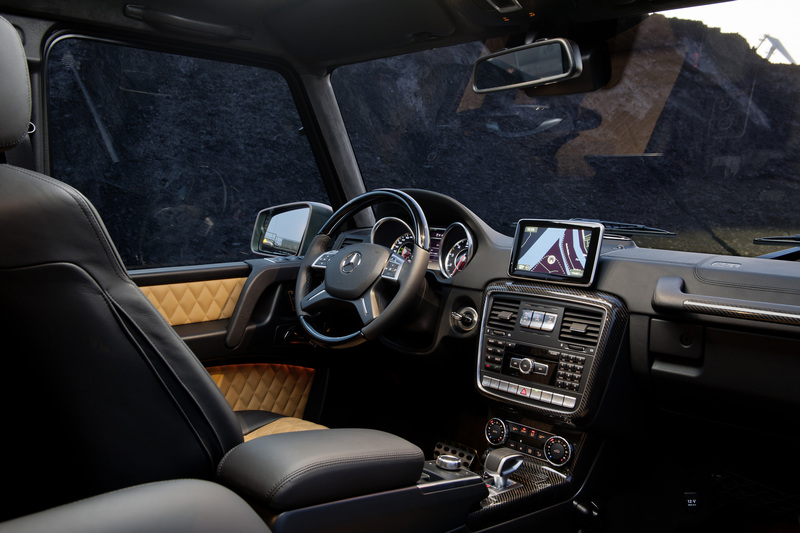 Newly redesigned interior in the 2013 Mercedes-Benz G-class. Photo courtesy Mercedes-Benz North America. Along with the interior, under the hood is yet another place where you can find differentiation. The standard G550 has retained a 5.5-liter V-8 engine, now producing an additional six horsepower for a peak output of 388. Peak torque has remained unchanged at 391 lb-ft. Power is transferred to the road via a seven-speed automatic, different from the previous five-speed automatic. 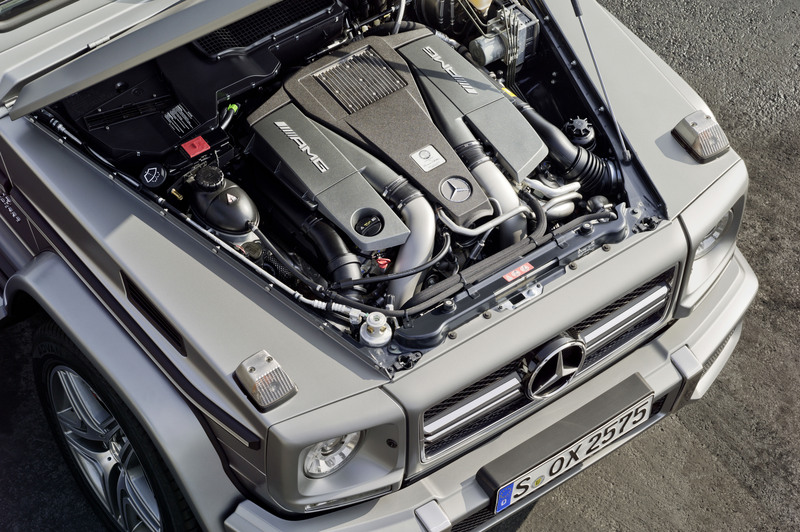 Despite the small improvements in the standard V-8, the high-performance G63 AMG has a completely new power plant propelling it down the road. Out is a 5.4-liter supercharged V-8 and in its place is a 5.5-liter twin-turbocharged unit. The new engine produces a maximum of 544 HP and 560 lb-ft of torque along with an “Eco” stop/start function that seems to be making its way into nearly every new Mercedes that makes its way onto the market. The tiny increase in displacement and the addition of turbos results in a 44 HP and 34 lb-ft improvement over the old engine. Badging has also changed from G55 AMG to G63 AMG for new high-performing G-class. 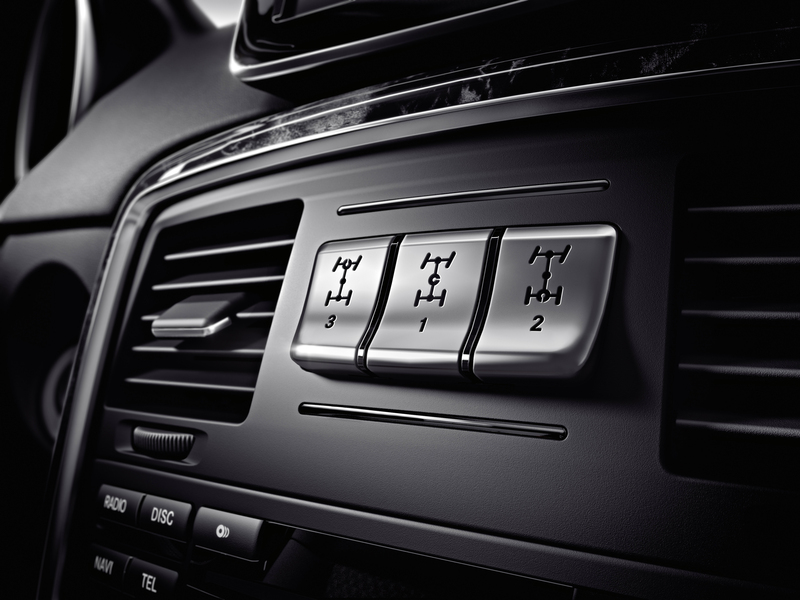 The three buttons for the three locking differentials in the 2013 Mercedes-Benz G-class. Photo courtesy Mercedes-Benz North America. 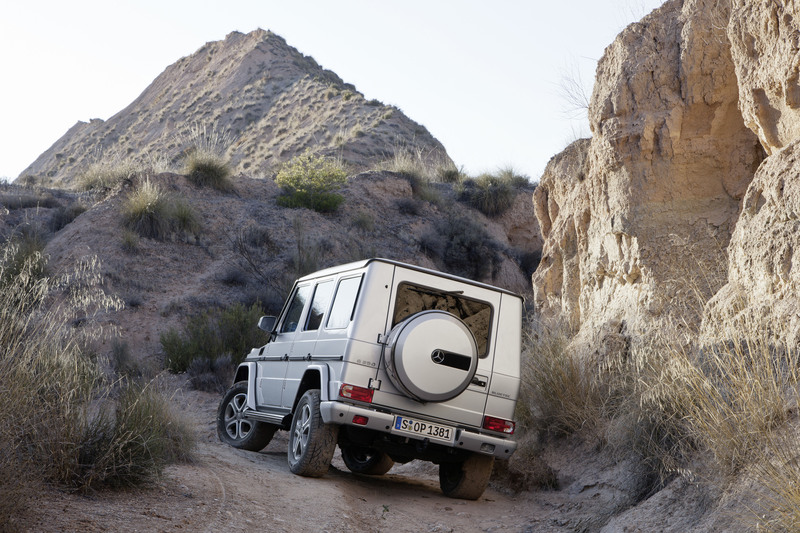 The G-class is definitely a vehicle that is capable of tackling on-road or off-road duties. 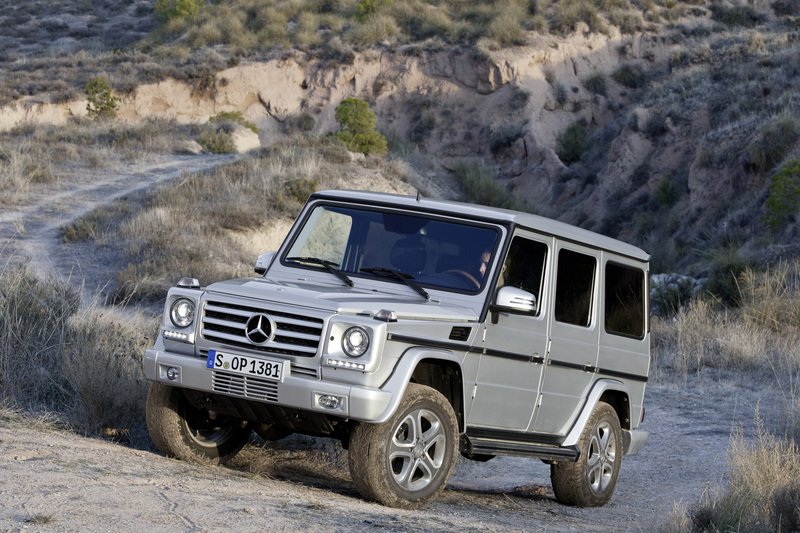 Unlike the GLK, M and GL classes, the G-class is the Mercedes you want to be in when going off-road. 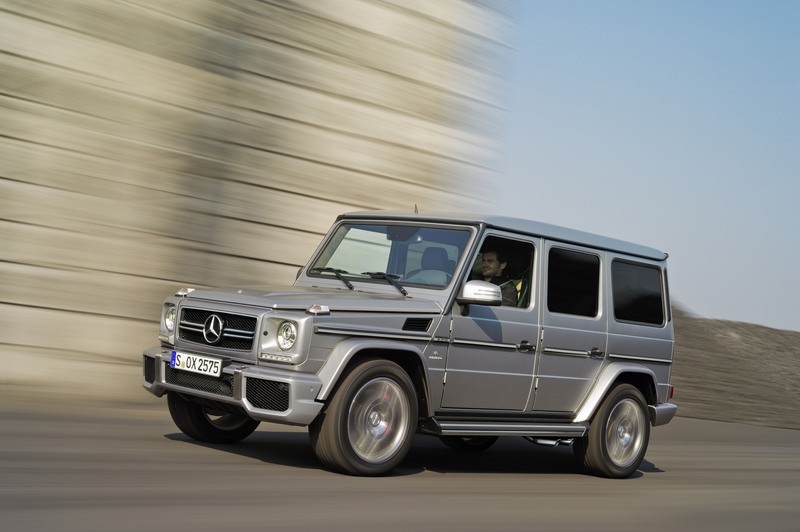 When you combine technology such as the three locking differentials and the torque-crazy V-8 engines in both the G550 and G63 AMG you get a focused and purpose-orientated vehicle that is really capable of fulfilling its hefty claims and backing up its history of being Mercedes’ primer SUV. With all of this luxury and capability on-board don’t expect for either of these luxury SUVs to come cheap. 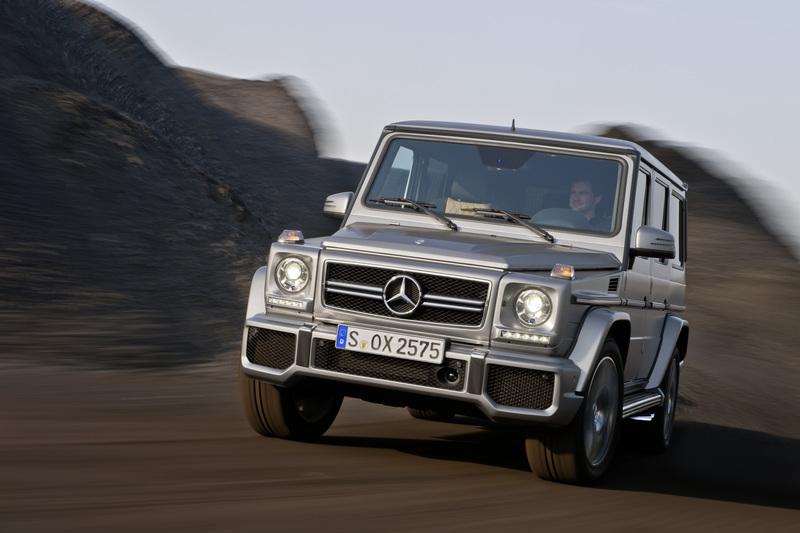 No official figures for the 2013 G-class have been released, but judging by the 2012 model customers can expect to spend in excess of $107,975 for the G550 and $124,450 for the G63 AMG when they going on sale this August. Remember the days when it used to take a manufacturer months, if not years to develop a high-performance variant of a model? Well, in anticipation of the 2012 Geneva Auto Show the new SL63 AMG has been unveiled just five weeks after the SL550 made its initial debut. 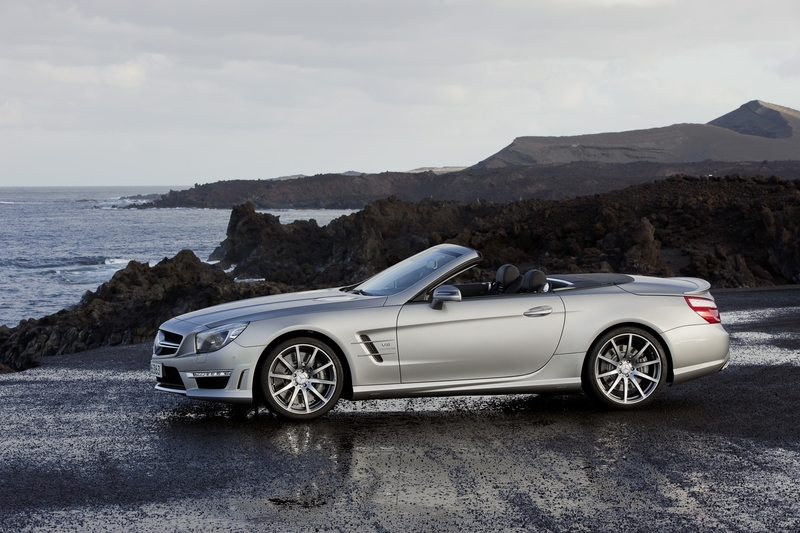 The new SL63 AMG is lighter, more powerful and is up to 30 percent more efficient than its predecessor. Much like the Porsche 911 (991), Mercedes’ most iconic drop-top has turned to an aluminum bodyshell, reducing overall weight by 275 pounds, counteracting the added technological and safety features that contribute to a greater load. Now, the SL63 AMG is not a light car by any means. With a curb weight of 4,059 pounds it weighs just 500 pounds less than a full-size Chevrolet Silverado 1500. Less mass to accelerate is always a good thing when it comes to a vehicle’s performance, but its even better when less is combined with more, namely in the form of horsepower and torque. For the first time the SL63 AMG will be available with two different power outputs. 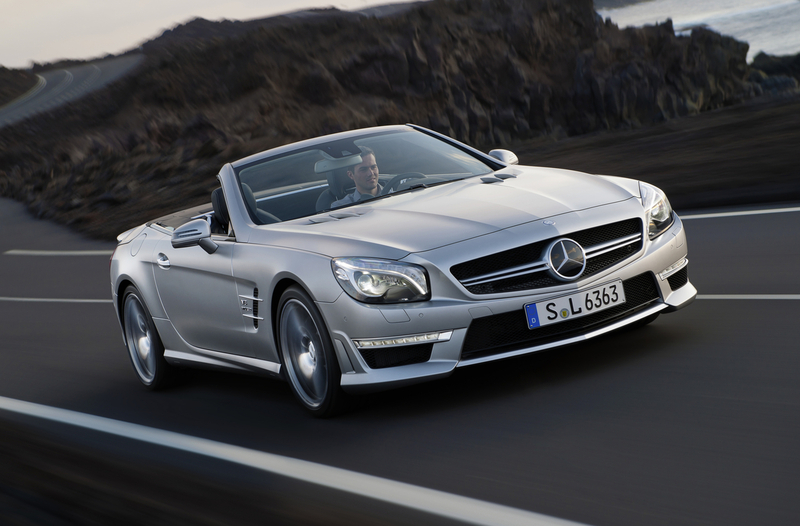 A standard SL63 AMG comes equipped with the same 5.5-liter twin-turbocharged V8 found in the CLS63, E63 and CL63 AMGs. In its tamest form the hand-built, power plant cranks out 530 horsepower at 5,500 rpm, and 590 lb-ft of torque from 2000-4500 rpm. For most, this would be more than enough. But if you want to experience the engine’s full potential you can opt for the optional AMG Performance Package. This boosts the output from 530 hp and 590 lb-ft to 557 hp and 664 lb-ft. The added horsepower and torque aids in 0-60 times too, allowing the SL63 AMG to accelerate to the mark in 4.1 seconds, one tenth quicker than without the package. Other changes include AMG performance steering wheel, limited slip differential and red-painted brake calipers. Putting the power to the rear wheels is the familiar seven-speed AMG SPEEDSHIFT MCT sport transmission found in the majority of AMG models. The four driving modes; Controlled Efficiency (C), Sport (S) , Sport plus (S+) and Manual (M) work in conjunction with a revised and upgraded AMG sport suspension and a new electro-mechanical steering system. Additional options include a locking rear differential, AMG performance suspension and ceramic high performance compound brakes and an increased top speed from 155 to 186 mph. Exterior design has maintained largely the same as the previous generation. The front has a lower and streamlined appearance. The grill is still emblazoned with the oversized three-point silver star, but fog lights integrated into the lower grill have been replaced with sleek LEDs below the headlights. The rear of the 2013 SL63 AMG has changed more than the front, with taillights that are almost entirely red in color. The rear diffuser has been significantly reduced in size, and the AMG sport exhaust tips have changed from round to a trapezoidal shape. 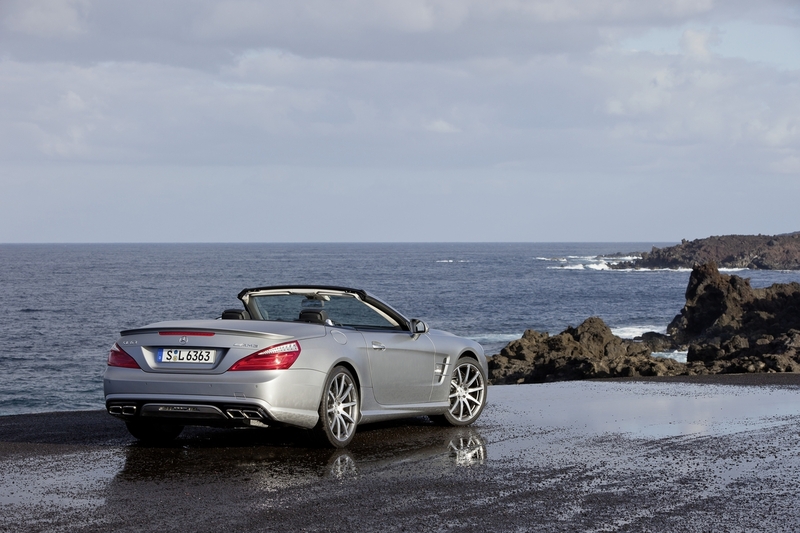 The SL63 AMG will go on sale later this year. If you’re looking for a premium luxury roadster with plenty of creature comforts, and performance that will keep pace with all but the fastest Porsches, this might be the vehicle for you. However, you better have deep pockets. Although no pricing has been announced you can expect a base MSRP in-excess on $140,000. 2012 Mercedes-Benz C63 AMG Coupe Black Series: Courtesy MB North America. Just days after Mercedes AMG revealed their all-new powerful and fuel efficient, naturally aspirated V8 engine the M152, they have unveiled an all-new vehicle. The 2012 C63 AMG coupe Black Series is the most powerful C-Class ever produced and has the performance to back up its aggressive styling and looks. 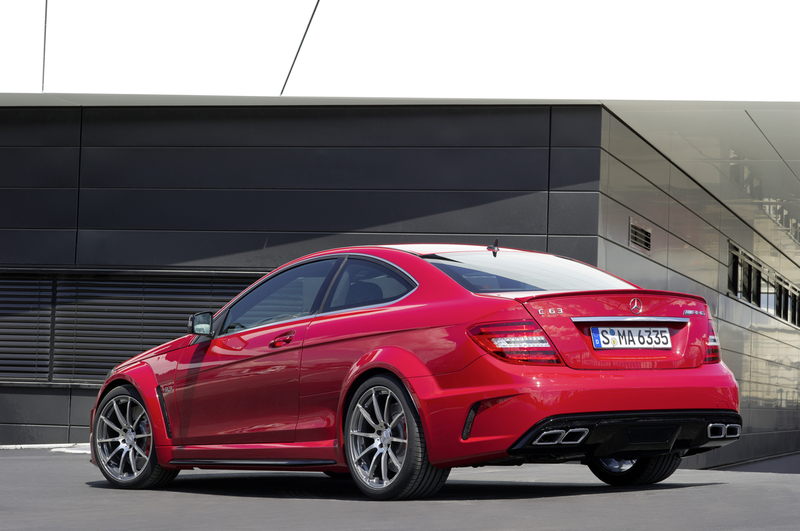 As with the other three Black Series models that have been released since 2006, the 2012 C63 Black Series is a no-holds-barred version of AMG’s regular C63 coupe. 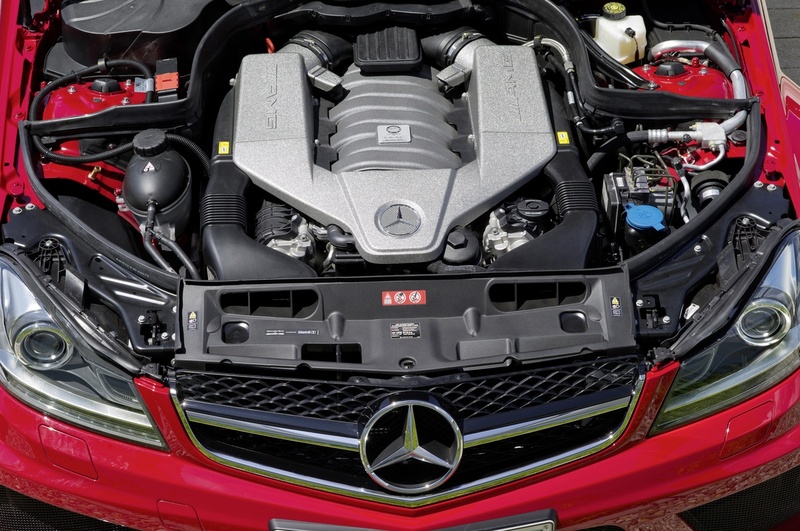 Unlike the fuel efficient 5.5-liter in the 2012 SLK55 the engine in the C63 Black Series is designed with one thing in mind, high performance. The 6.2-liter, naturally aspirated V8 cranks out a whopping 510 hp at 6,800 rpm and 457 lb-ft at 5,200 rpm, accelerating the two-door from 0-60 mph in just 4.2 seconds. This power and torque is handled by the AMG SPEEDSHIFT MCT 7-speed sports gearbox, with four driving modes including the fastest “Sport Plus” and “Manual” modes for lightning quick shifts. 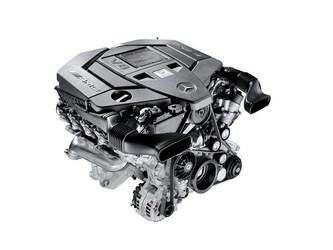 6.2-liter V8 engine producing 510 hp: Courtesy MB North America. Numerous styling and engineering cues were taking directly from the racetrack in an attempt to save weight and make the C63 AMG coupe Black Series as aerodynamic as possible. The AMG Aerodynamics Package includes exterior winglets and a fixed spoiler at the rear. Both pieces are made from carbon-fiber and help to increase the downforce at the front and rear axle. Accompanying the weight-saving carbon-fiber elements are lightweight alloy wheels. The 19-inch titanium gray wheels use a special forging process that results in a weight reduction of 24.2 pounds when compared to conventional wheels. To make the special forged wheels perform to their maximum one might opt for the AMG Track Package. This package is made up of Dunlop sport tires measuring 255/35 R 19 in the front and 285/30 R 19 in the rear, and aid to increase the overall grip of the vehicle during spirited driving on road or at track days. Despite not being easily visible, the undercarriage of the C63 AMG Black Series is just as focused as the exterior. This particular Black Series features a specially designed AMG sports coil-over suspension, along with a locking rear-axle differential as standard. The coil-over suspension allows the driver to choose a number of different settings and options to suit the individual’s specific needs and demands. The differential lock also enables the operator to choose from various setups depending on their driving conditions. Rear View of 2012 MB C63 AMG Coupe Black Series: Courtesy MB North America. Finishing off the C63 AMG Black Series is the motorsport-inspired interior. The two front AMG sport seats keep the occupants secure and planted during even the most demanding driving conditions. Interior sections such as the red seat belts and dashboard finished in high-gloss black piano lacquer give sharp contrast to the steering wheel, seats, door trim, door armrests, center console and shift lever, all of which feature red stitching. 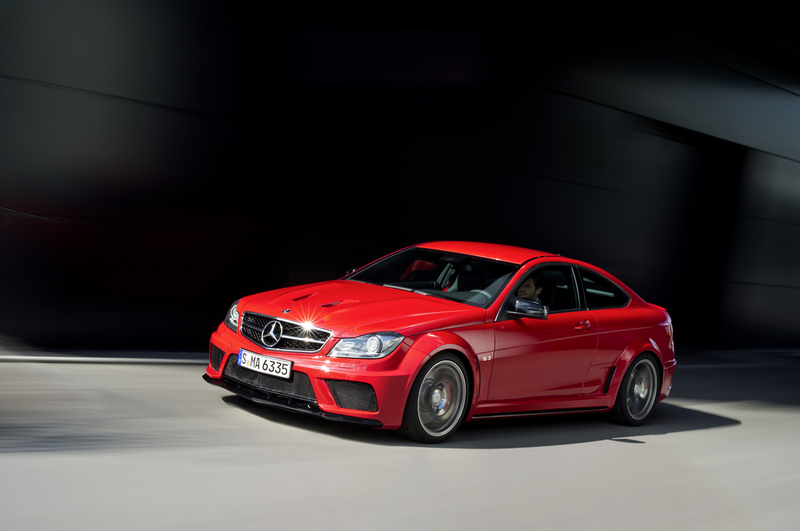 The 2012 C63 AMG coupe Black Series made its world premiere today at the famous Nurburgring and is scheduled to make its debut in the U.S. beginning in early 2012. Interior 2012 Merc C63 AMG Coupe Black Series: Courtesy MB North America. The eight-cylinder engine. Its characteristics has become synonymous with high horsepower, frame-twisting amounts of torque and speed. However, with fuel economy and overall efficiency becoming more important with each passing day, how much longer does the venerable V8 have in a world full of fuel-sipping four-cylinders? Thankfully all the power-hungry, speed-loving enthusiasts need not be afraid. Yesterday Mercedes AMG announced the creation of an all-new naturally aspirated V8 engine, designated internally as the M152. The new V8 will make its world debut at the Frankfurt International Motor Show in September, and will power the new 2012 SLK55 AMG, the only vehicle in its segment to feature a eight-cylinder engine. The M152 is the equivalent of Dr. Jekyll and Mr. Hyde with two completely different personalities. The new AMG-derived V8 delivers impressive horsepower and torque figures expected from a hand-built AMG engine, but with a twist. And no, the twist does not refer to the amount of torque inflicted on the frame, rather that the M152 delivers the efficiency of a four-cylinder engine. One might ask how this combination of power and efficiency is possible. The answer is both simple and highly complex, with technology, and lots of it. Engineers at Mercedes’ high performance headquarters have incorporated their AMG Cylinder Management cylinder shut-off system into this new V8. The result of this technology is an engine that is capable of producing 415 hp at 6,800 rpm and 398 lb-ft of torque at 4,500 rpm. Not only does this engine produce an additional 60 hp and 22 lb-ft when compare to its predecessor, but it is 30 percent more fuel efficient. When designing the M152 AMG engineers took ideas and inspiration from the twin turbo 5.5-liter M157 that powers the likes of the CL63 and S63 AMG. The displacement of both engines is identical, along with the ECO stop/start system. However the M152 differs from its forced induction cousin with a different air intake, cylinder heads, modified valve drive, an adapted oil supply system and an optimized crankcase. The AMG Cylinder Management cylinder shut-off system is a perfect example of just how much technology is going into today’s high-end automobiles in a never-ending attempt to make them more fuel efficient without sacrificing overall performance. To understand how this improved fuel economy is achieve you need to understand how a system like AMG’s cylinder shut-off system works. When driving in the Controlled Efficiency “C” transmission mode, cylinders two, three, five and eight in the M152 are cut off during partial load. This is available when the engine is operation between 800 and 3,600 rpm. During this range the engine still produces a minimum of 170 lb-ft of torque when running on only four cylinders. If and when the driver feels they need more power and reaches the 3,600 rpm plateau the engine engages the additional four cylinder in less than 30 milliseconds. The technology placed in the M152 is remarkable, especially when you consider that many of the advanced systems making their way into passenger vehicles were, up until a few years ago, strictly reserved for million dollar race cars. As the auto industry makes its way further into the 21st century it will continue to have to innovate and improve to start ahead of new restrictions and regulations. However, if the M152 proves anything it is that world class performance and fuel efficiency to match can coexist.